Dr. Kim received her BA in Chemistry and Anthropology from Brandeis University, Waltham, MA, her PhD from City University of New York and her MD degree from Mount Sinai School of Medicine of NYU. She completed her residency training in Anatomic Pathology at Yale University School of Medicine, and a fellowship in Dermatopathology at Yale University. 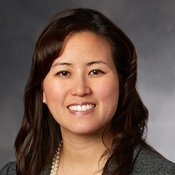 Dr. Kim is Assistant Professor of Pathology and Dermatology and Director of Dermatopathology at Stanford University Medical Center, Stanford University School of Medicine. She is board certified in both Anatomic Pathology (American Board of Pathology) and Dermatopathology (American Board of Pathology and American Board of Dermatology). Her research interests include melanocytic lesions, fibrohistiocytic neoplasms, and genodermatoses.